HeyPlantMan! 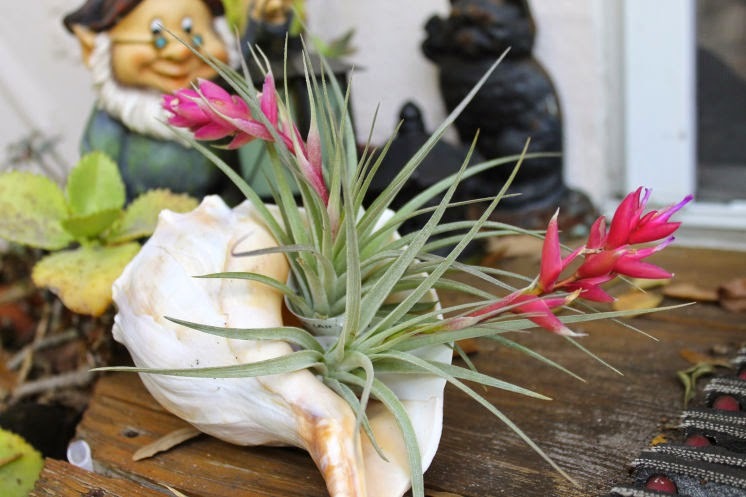 Exotic Tropical Plants from St. Pete FL: Winter over, its Time to Spring ahead ! Winter over, its Time to Spring ahead ! 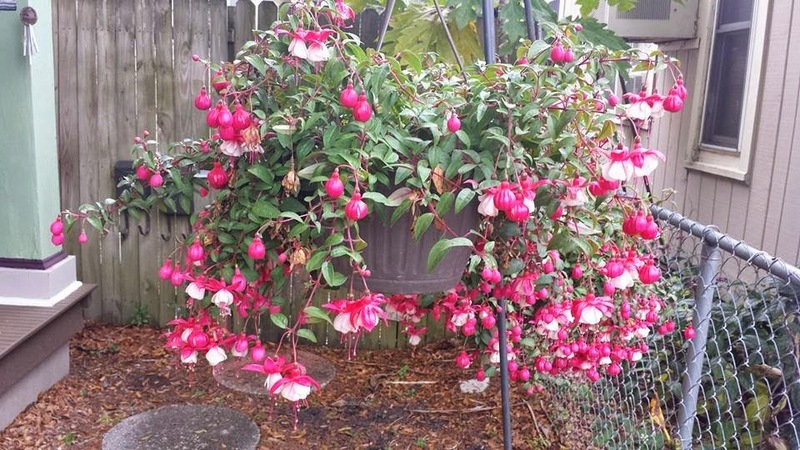 We love it when our customers post photos of their beautiful plants that have purchased from us at market and the Fuchsia plant at left is a prime example of a plant thriving in the right place at the right time ! Fuchsia love our cooler weather and bright indirect light and this area off the porch is the perfect place to let it thrive and grow. Another thing to remember when you purchase hanging plants: most people want to go for the basket that has the most immediate all over color, but actually, your best bet is to get a basket when it is just starting to flower and has loads of buds. That will give you the longest time period of flowering for you to enjoy. When Khristy purchased this particular basket over a month ago, it just had a 1/2 dozen blooms just starting to pop but was loaded with buds, and as you can see now, it is has really popped ! I am pleased to report that my early (meaning, very early) Spring mini-plot continues to do very nicely. This photo is courtesy of our good friend, Penny Carnathan, who has a wonderful website and Facebook blog (digginfloridadirt). She happened to be in our neighborhood and took the shot about a month after I had planted it in January when it was still so warm and I was dying to get my hands dirty and I had managed to wrestle a very small area away from our nursery stock collection in my yard. 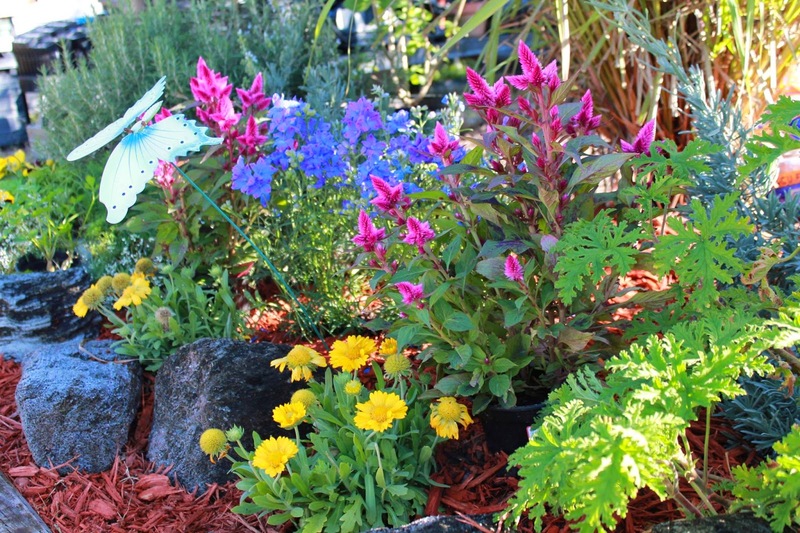 The blue delphinium, Celosia intenz and yellow guallardia just love all being together. The recent cold spell did not faze it a bit and I have barely watered it since planting. A big Rosemary on the left and a Citronella geranium on the right nicely frame the small bed, backed by a large Lemon Grass gigantea. This Winter season at market has been remarkable with great crowds and great business for all of us vendors. The Tillandsias continue to be a big hit with customers and many come back every week to get more to add to their collection. We always have a variety of shells, wood and misc. that make for great ways to display your " tillys". 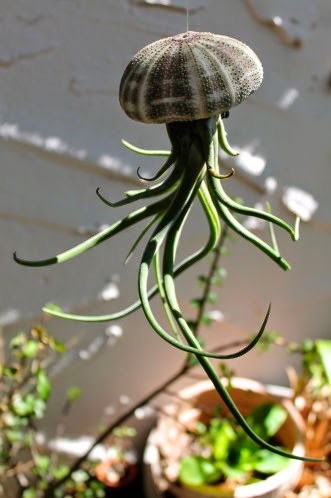 The photo at right is of a Tilly Octopus, a very fun way to hang your plant in your home or garden. Shells are an easy way to display. Just take your tilly out once a week, give it a good soak in container of water for 5 or 10 minutes, shake it out, and replace it back in the shell. (above photos courtesy of Penny Carnathan, Tampa Bay Times). In the coming weeks, our Spring botanical shows really start ramping up, and we are looking forward to these big shows. Keep tabs on our blog for our schedule and news about Market and Shows coming up. And, this time of year always brings out our favorites, TROPICAL HOLLYHOCKS !! In a couple of weeks, they should be ready for all their avid fans, so stay tuned for news about their availability. Meanwhile, see you at Market this Saturday !